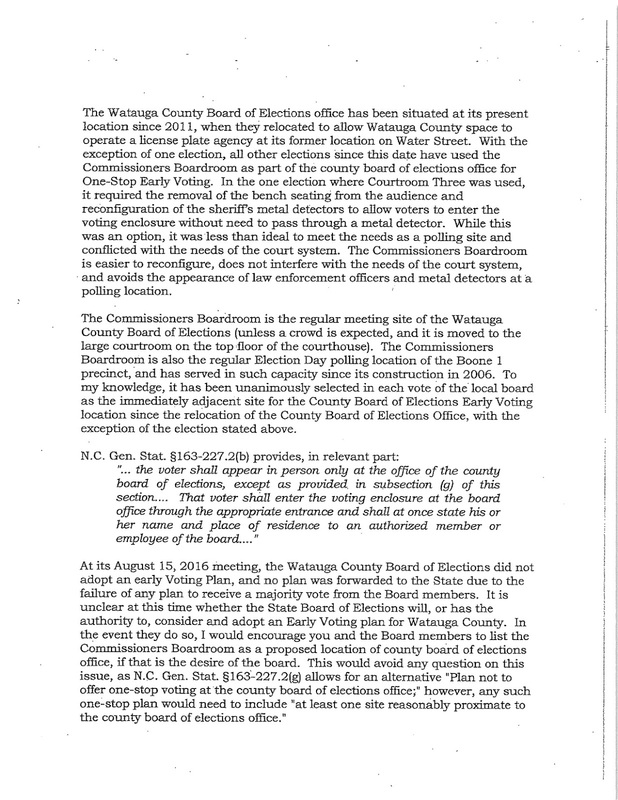 That for purposes of Early Voting, the county BOE office includes the next door County Administration building. 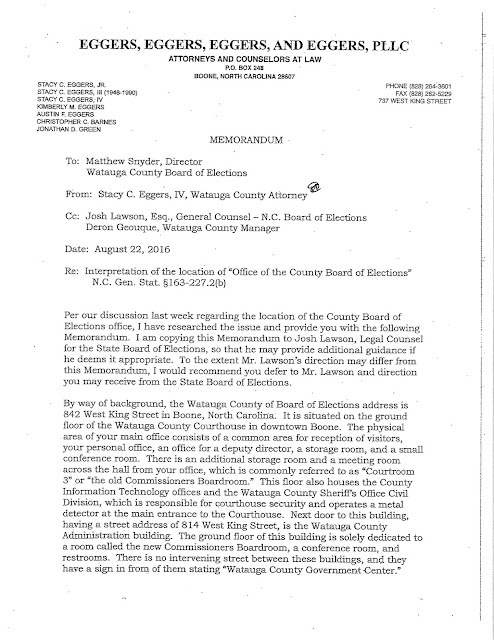 That "legal" interpretation is important only because Eggers and BOE Chair Bill Aceto intend to "default" on providing any satellite polling stations for Early Voting and force all Early Voting activity into the BOE offices (as required by statute when there is no plan for Early Voting). Since the actual BOE office is wholly inadequate -- laughably so -- hence Mr. Eggers' need to declare the county Admin. Bldg. a part of the BOE office. He does that bit of fast footwork primarily on the "history" of the use of the Admin. Bldg. for Early Voting in the past. What Eggers glides past is a bit of a catch for his scheme: the Admin. Bldg. 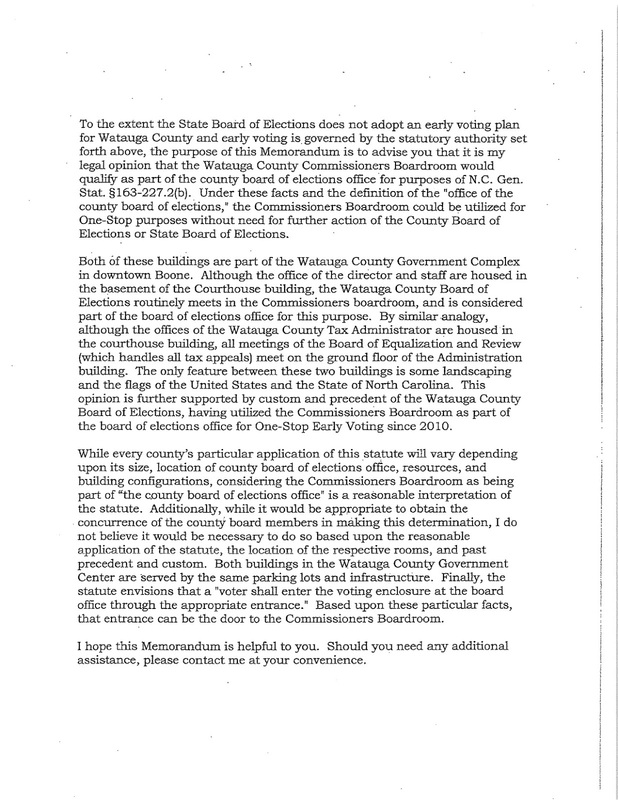 was used for Early Voting in lieu of the BOE office as part of an Early Voting plan. According to statute, a BOE cannot use a separate building (however adjacent it may be) in lieu of the main office unless a plan for Early Voting has been discussed by BOE board members, voted on, and adopted unanimously. As you know, O my children, the BOE refused to adopt any Early Voting plan. Democratic member Stella Anderson submitted her plan to the State Board of Elections. 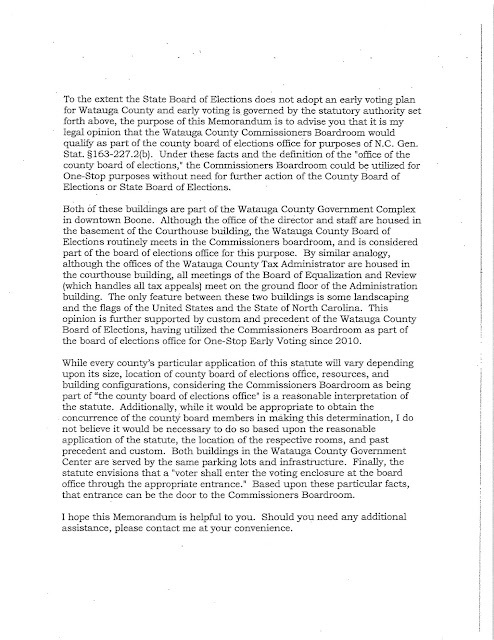 So did Bill Aceto, at the last minute, claiming in his covering memo that he believes the SBOE really can't impose an Early Voting plan on Watauga. What Else Does Eggers' Memo Say? Four Eggers tells Matt Snyder that Snyder has the authority, without interference from the SBOE, to declare the Admin. Bldg. 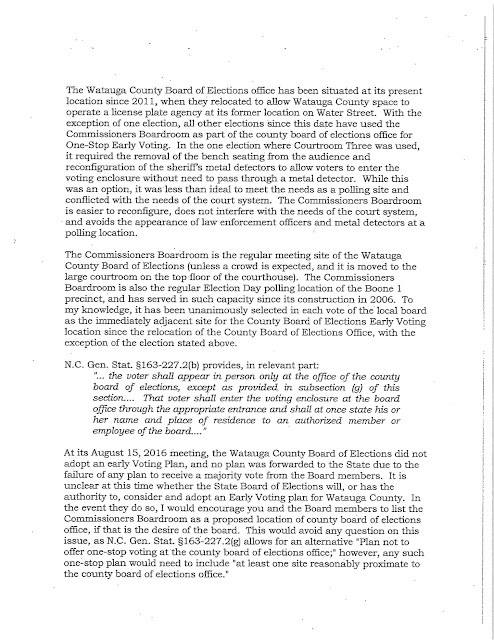 a part of the BOE office, and Eggers further questions the authority of the SBOE to impose an Early Voting plan on Watauga County (last paragraph on page 2 and first paragraph on page 3), a position to which Bill Aceto is now clinging as to a life raft. 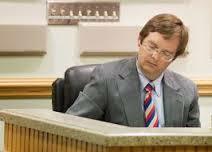 Eggers is not interpreting the law as it's written but rather the law as he wants it to be. This is not legal wisdom. It's politics. What will the SBOE do? We'll know soon. Four Eggers is extremely corrupt. I feel sorry for his family. Regarding Snyder making declarations "without interference from the SBOE" -- did anyone really expect the Republicans to appoint a tool, and then never use it?